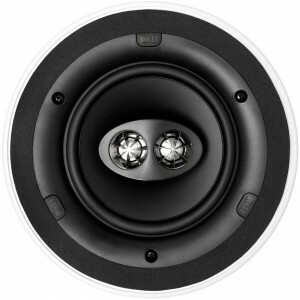 KEF Ci160CRds thin-bezel in-ceiling speaker is a high-fidelity flush-mount dual stereo speaker that is ideal for locations with room for only one speaker. KEF Ci160CRds is a Dual Stereo in-ceiling speaker ideally suited for smaller areas where there may only be room for one speaker; such as cloakrooms or bathrooms and with moisture-resistant fixings they can be used indoors or out. The KEF Ci160CRds dual Stereo speaker is a high-fidelity flush-mount model that recreates stereo, and is ideal for locations where there is only room for one speaker. Thanks to KEF's simple and ingenious screw down clamping system you can place these speakers in environments such as bathrooms or under eaves.